Surely we all remember seeing the legendary School House Rock "I'm Just A Bill" Cartoon at some point in our youth during one of the many mornings we sat transfixed in front of the TeeVee...then again, for some of you Pokemon/Generation-Y folks out there, that may be before your time. At any rate, suffice it to say, it was a milestone in the civic education of millions of young Americans regarding the legislative process of how a bill becomes a law. Ironically, for many Americans, it was probably the last time they ever actually learned about the laws in Congress that effect their every day lives. 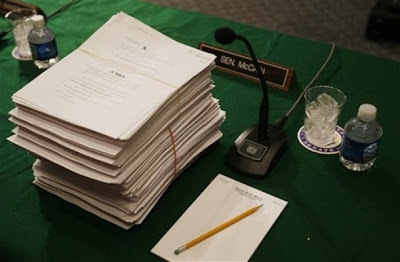 Well today we can change that (if only for the small amount of time it will take you to read this post) by taking a look inside the infamous Health Care Bill. If we recall our "Just a Bill" cartoon lesson, both houses of Congress have to pass their own version of the Bill in order for it to go forward to be signed into law by the President. But what the Cartoon didn't tell us when we were pre-schoolers is that in order for a Bill to become law, each house must eventually pass IDENTICAL versions of the legislation before the President can sign it. Obviously the House Bill is currently different from the soon-to-be-passed Senate Bill. Once the Senate Bill is finally passed, the law requires the Senate and the House to sit down and compromise with each other in order to make both of their Bills say the exact same thing - this is known as the "Reconciliation Process." Lady Z did a post discussing that process here. 2016. Does not require employers to offer health insurance. Public Option will not cover abortions. Private health plans can choose whether to cover abortion. ($33,075 for a family of four). This will cover 15 million new Americans. will cover 14 million new Americans. premium revenues on medical claims. ($88,200 for a family of four). earning more than $80,000 a year. to raise $460 billion from 2011 to 2019.
growth in Medicare and other federal programs over 10 years. premiums over $8,500 for individual coverage and $23,000 for family. $1.052 trillion over 10 years. Expected to reduce the deficit by $139 billion. 36 million people would gain coverage, leaving 18 million uninsured. $871 billion over 10 years. Expected to reduce the deficit by $132 billion. 31 million people would gain coverage, leaving 23 million uninsured. You may now return to your normally scheduled program (aka: ignoring Congress).